In certain constructions, the habitual aspect marker in Sargaĺk can appear on nouns in locative cases (or in the comitative cases). At times, these are zero-derived verbs, at times, they are more like regular nouns. The verbal uses, however, differ from regular verbs in that the case marker occupies the normal person congruence spot. Sargaĺk is still very much pro-drop for subjects, so even these verbs may lack explicit subjects. With inanimates, it can signify repeated use of an instrument, e.g. This particular example can be used with personal names or titles as well as words such as the different types of siblings-in-law and such. It's generally quite a condescending construction. The plural suffix here is part of the construction - with the singular case suffix -rne it would simply signify 'to habitually go to' or 'to habitually be, as per X's opinion'. The latter meaning generally takes an adjective too. Mostly, nouns referring to locations - both proper nouns and regular nouns - will simply signify the subject generally being there, coming from there or going there habitually. The Ćwarmin-Ŋʒädär family has a morphological universal that might be of some interest: there is a particular structure to nouns derived from verbs. The significance of this is that instrumental nouns (opener, key, etc) are derived from the agentive form (runner, builder, etc), and locative forms (diner, etc) are derived from patientive forms. 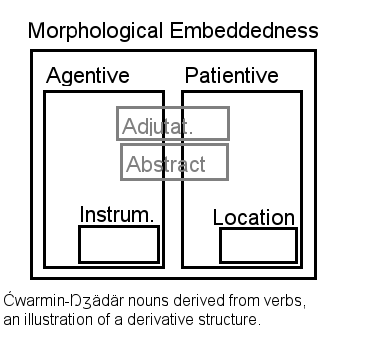 The adjutative form (a 'helper' noun with rather varying meanings) and the abstract form are less closely aligned to the agentive and patientive forms - adjutatives almost always, however, are embedded in one or the other, whereas abstract nouns can be more closely related to infinitives, the verb stem or the present tense stem. A good spot for placing one's nets is sirpisəmi, but the tool for repairing the net is a źaŋkasta. The lack of an adjutative implication might seem to justify leaving it out of the graph altogether, there are some interesting things that justify keeping it. 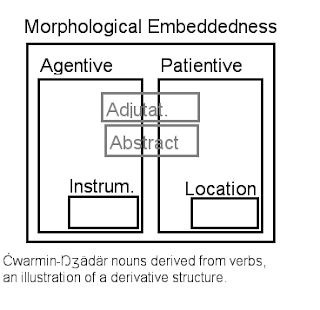 The Dagurib language, for instance, permits productive switching of the adjutative between agentive- and patientive-derived forms with slight difference in meaning, e.g. Mostly, the "patientive adjutative" will be less animate than the agentive adjutative, but the pair given above is one out of many exceptions. In Ŋʒädär, a number of adjutative nouns are derived from the patientive form, although a majority derive from the agentive. The patientive adjutative seems to be more likely to appear with intransitive verbs than with transitive, but it's a minority for both. Differentiation has later occurred, though, and different languages have come up with different suffixes to produce these forms, often reduced forms of words like 'thing' or 'place' or 'tool' or 'stone'. 'Stone', funny enough, appears for 'tool' in some ĆŊ languages, and for 'place' in some others, in part due to the importance of stones as markers of property in some areas. In Ćwarmin, the pseudo-participles are closely related to the agentive and patientive noun forms. This does not necessarily hold for other ĆŊ languages. A conculture whose writing system is exclusively flower language, where each type of flower stands for a specific morpheme; new flowers must be bred for every new slang word. A Look at the Drafts Folder! A terrible habit of mine when it comes to writing, is that I produce a lot of stuff that ends up sitting in the drafts folder forever. This blog is not the worst example of that - somerationalism has the drafts folder contain about 2/3s of the posts that I've written this far. For this blog, it's closer to 1/8. The reason the stuff ends up sitting there is basically that I run out of ideas what to do with it, and keep it for future editing. Let's go and have a look at some of the posts that might one day come out of their dark cocoons. I set out by actually deleting a few that are just a title without any content. Among these we find 'adverbs as verbs'. I remember thinking about moving a lot of the functionality of adverbs in European languages to more verb-like structures, but I didn't really get inspired enough to develop the idea much further. Another post that has an interesting concept behind it is "Details #110-#120: A Phonology (Done Right)". The title is intentionally a bit exaggerated, but it reflects my feeling that many conlangers simply do not go that deep into phonology. I don't mean to say that the phonemes and distinctions conlangers use are boring or anything - I mean to say that the descriptions simply show lack of familiarity with the kind of work that phonologists and phoneticians do. I also wanted to include some kind of reflections on writing fictional empirical research results. I think there are reasonable constraints on what makes sense in a naturalistic conlang, at least, constraints that rest on epistemological foundations. Yes, as conlangers we're the ultimate arbiter of what goes in our language, but if we want to pretend we're doing realism, we also need to at least familiarize ourselves with empiricism as it relates to language. Needless to say, the numbers in the range for the phonology post, if it ever gets finished, have to be adjusted a bit. Then we find A Review: Possible and Probable Languages. Probably going to be finished next year. Beyond that there's A Language Inspired by a Post at Badconlangingideas. This is a post where I keep adding ideas for a swing-dance based language. However, I have not really gotten into any depth with it yet, although my fascination for both linguistics and the lindy hop should be a fertile ground for it. I keep it around as a record-keeping thing. Three posts on Barxaw, one from before it even had a name occur. One is a Table of Contents that links all the Barxaw posts, and sets out a main plan for new posts, essentially - a thing I probably should do with regards to my other major projects as well. Some Ideas for Scripts. I have not posted much about scripts in general here, but that is basically a repository for ideas regarding writing systems that might germinate into a proper post some day. The sole idea in there right now basically proposes a scripts the writing or reading (or both) of which is a P-complete task. Detail #141: Some Tweaks on Definiteness. Pretty much what it says on the label - an attempt at tweaking definiteness with regards to how it works in English. A look at definiteness in other languages. Other ideas occurred to me at the time, and so it didn't get much attention for a while. A thing about verbal subordination in Dairwueh. Several posts about teaching your child a conlang, with lots of sources. I am still reading research regarding first language acquisition and bilinguality, though, and making notes, so those might take a while. That's but a sample, there's about 70 posts there. Posted in grammar | Comments Off on A Look at the Drafts Folder! Bryatesle permits pro-drop both for subjects and objects. However, the pro-drop seems to adhere to certain principles. The subject and the object seem to have rather opposite principles, however. the subject is explicitly present with the leftmost verb in a clause with a subordinate verb, or is explicitly present with the non-subordinate verb regardless whether it is the leftmost or rightmost. In such a clause, any other verb with the same subject may entirely drop any realization of the subject. a discourse topic that is an object as well as an 'embedded subject' (thus, essentially, a discourse topic that would be having the secondary subject case if it were explicit). Thus "so-and-so forced X[discourse topic] sell the house" would come out as "so-and-so forced sell the house"
a verb that cannot be intransitive, when there's a clear "discourse object" that also is the object of that verb, or when the discourse topic is the object of the verb. a verb that cannot be intransitive, and is 'semi-coordinated' with a previous verb that had an object. This semi-coordination generally takes the form of adverbials implying simultaneity, sequentiality, resumption or other causal connections. My previous word for mirror was isile. I wanted to use the common letter P in the new word. The word mirror doesn't occur in Alice's Adventures in Wonderland or Through the Looking-Glass, although looking-glass is synonym of mirror. Consider the correlation between definiteness and direct objects. Granted, topics and subjects too have a similar and probably stronger correlation with definites, but let's disregard that for now. Objects, unlike subjects, tend to be more marked than subjects, which is what we want for this areal tendency. Have object marking tend to become definiteness marking for subjects as well as objects over time. How this would work out for case-marking is obvious. The challenge might rather appear in considering how a language that mostly does mark for object and subject congruence on the verbs would develop within this tendency. My previous Miresua conlang word for bell was kolna. I'm changing this word so that it doesn't end in -A. In addition, I'm using the P from the Basque word. I found once instance of the word bell, actually the plural bells, in Alice's Adventures in Wonderland. There are a bunch of morphemes that can be used with verbs to mark a variety of meanings. Some of these interact with object definiteness in what exact meanings they convey. Parentheses at onsets give parts that can be left out due to morphophonological processes with regards to the verb root, parentheses at the other end are parts that are left off to form the new verb root. The suffix -(v)ara-/-(v)ərə- signifies attempting to do something. Thus kuvara means 'attempt to open', lesivərə means 'attempt to catch fish', śaŋikara means 'attempt to appear' (if it has a complement) or 'attempt to impress' (if it only has a recipient). The suffix -iŋe- or -uŋo- signifies doing something clumsily or without any knowledge as to how to do it. Thus kuvuŋo would signify attempting to open something very clumsily. -um(u)- or -im(i)- suggests doing something very lightly or gracefully or easily. -osos(o)-, -esəs(e)- implies doing something very productively. -ris- and -rus- mark doing something over a long span of time. -nimin- and -numun- signify struggling to complete something. -sesk(e)- and -sosk(o)- signify doing something unintentionally, and -kinś(i)- and -kuns(u)- signify doing something badly. There are a handful of verbs that can only appear with some set of these and never without such a suffix. The root *Karća- would signify 'aim', but it always has some suffix. Often -ara, since aiming is an attempt. However, a bad aim is also permitted - karćuŋo. Karćumu signifies aiming well, and karćanumun, with a definite object signifies repeated aiming at a goal; when intransitive or with an indefinite object it signifies habitually missing. Another verb is *merk?-, improve. It only ever appears with -vərə (mergvərə), -imi (merćimi), -esəse (merkesəse) and -sesk(e)- (meskeske, due to metathesis). The verb 'merkiŋe' is attested in one regular saying - simply stated 'inki (inkic) merkiŋi' - no one improves (things) by accident. This is used as an expression that exhorts to learning skills. You are currently browsing the Conlangers blog archives for December, 2015.